What’s wrong with Jim Cramer’s recommendations on Gold? Let me count the ways. As for limiting your Gold ownership to 10%? That’s up to you. 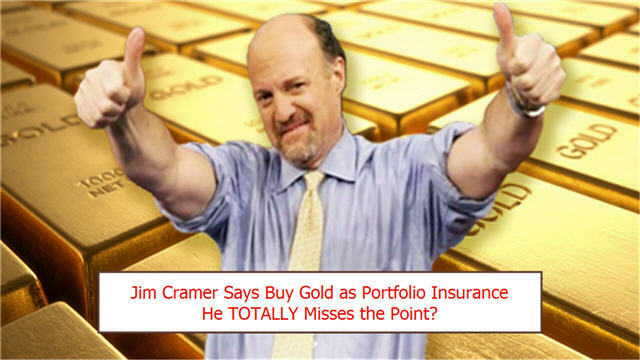 Cramer suggests that you buy Gold for portfolio insurance because as other things go down in price, Gold will go up. Well, over the last several years, can anyone definitely state an inverse price correlation between Gold and anything else? Whether it’s the manipulation of the Gold market or something else, bottom line is that it doesn’t seem to work that way anymore. Does that mean Gold is not portfolio insurance? Yes, to us Gold is WEALTH insurance, not PORTFOLIO insurance. Gold is wealth insurance because Gold (and Silver) have been money for 6000 years and, with some wild gyrations, ultimately protect your PURCHASING power better than anything else. Certainly better than ANY fiat currency. None of us here at BuyAndStoreGold.com knows anything about fine art, we know a smidge about real estate and we know QUITE A LOT about Gold and other precious metals. 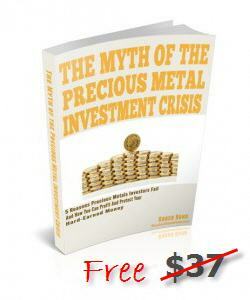 Buy Gold, but not in the expectation of protecting your stock portfolio. Jim Cramer suggests buying your no-more-than-10% of Gold via the ETF GLD. Naturally. As a Wall St insider he would like that ETF (we prefer SGOL for an ETF). ETF’s are the easiest way to buy a REPRESENTATION of Gold, but it’s NOT Gold. ETF’s are great for short term TRADING based on the price of Gold. But at the end of the day, all you ever are going to get (unless you ARE wealthy) is paper dollars in exchange. I don’t want to argue over whether the GLD fund really has the Gold it’s supposed to, whether or not it’s been re-hypothecated or any of those issues. It doesn’t matter. An ETF is not Gold, it’s PAPER. It won’t protect your wealth. And, though many people don’t realize it, it’s not necessarily cheaper than owning true physical Gold through one of the vendors we review on this site because the ETF does charge fees for storage, insurance, and other expenses of running a fund. You’ve never heard of BullionVault, GoldMoney, SilverSaver? Ok, so maybe you never have heard of The Hard Assets Alliance – you should! You can go to a local bullion shop and buy a 1/10 ounce Gold Eagle if that’s the only way you can start. Maybe you have money in an IRA you would like to protect with a portion in Gold (click here to learn about a Gold IRA with The Hard Assets Alliance). Cramer’s statement that only the wealthy can afford to buy physical Gold is untrue, and maybe even intentionally misleading. I submit most of our entire website as evidence that his statement is patently FALSE. Perhaps Mr. Cramer trusts banks… do you? We sure don’t. Thank you, no, Jim. We will trust private institutions who, unlike banks, know that they will go to JAIL if they engage in the type of fraud perpetrated by the Swiss bank in in question, and the Wall St banks who are not only too big to fail (and getting bigger & bigger), but also too big to JAIL. All 4 of those listed provide services for The Hard Assets Alliance, depending on the country jurisdiction you choose to store your physical, allocated, audited & insured Gold, Silver, Platinum, Palladium. The Hard Assets Alliance is our top recommendation. We have our own money where our mouth is, and have since HAA opened their doors.